It’s late March and a second wave of snow continues to deprive the UK of warmth. A press trip to Gran Canaria comes as a tonic. Campagnolo want to share an exclusive announcement with the world’s cycling press and we have an invitation. It’s far from Simpson’s usual territory, but we’re flattered by recognition from a brand whose recent straplines include the hashtag ‘#thoseintheknow’. We're not overtly tech-driven gourmands – a more prosaic appreciation for the union of functionality, practicality and aesthetics remains at the heart of Simpson – but we willingly accept an invitiation from arguably the most revered marque in cycling. Were we ready to take our place with the world’s cycling media? To talk tech with the technorati and get down with the industry? No, not really. We wanted to breathe in, live and experience for ourselves (and for you, our readers) the entire spectacle of a major product launch from a manufacturer whose history is indelibly linked with the sport that drives us. 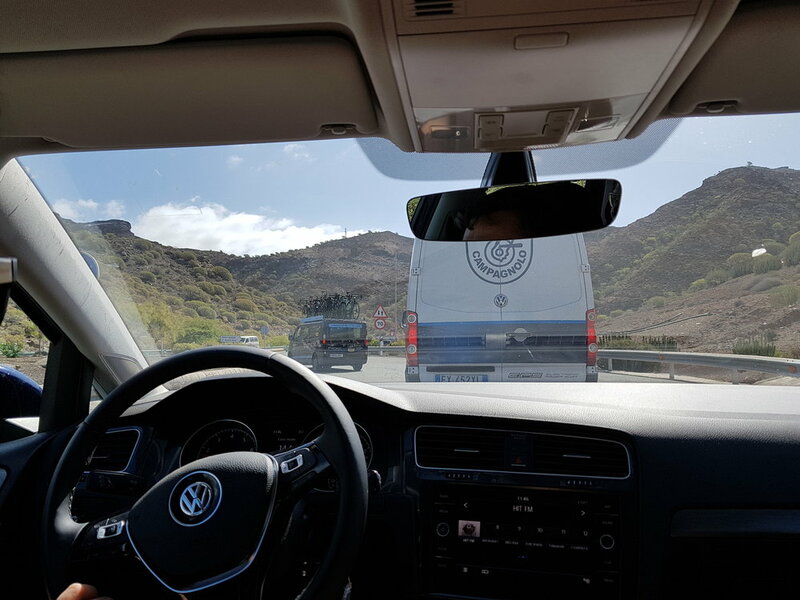 The UK was on the brink of snow (again) as we left for warmer climates, smug in the knowledge that rainfall was absent but for a few times a year in Gran Canaria. Armed with just pedals, cycling shoes and the usual hand luggage for a few nights away, we took our seat with a cross section of humanity on the 7am flight, down with the people for the four and three quarter hour flight. As we landed, the shock of the 4am pick up still hadn’t kicked in, but the total buzz and magnitude of what we had embarked on had. Beyond the pressurised and air conditioned confines of the cabin, Spain awaited in all it’s warm, pre-Summer glory. Our hotel’s interior was a total feast of fantasy. Think Delta brakes as ceiling supports, but on an industrial scale, with a ceiling adorned by stained glass windows of a scale more appropriate to a cathedral. 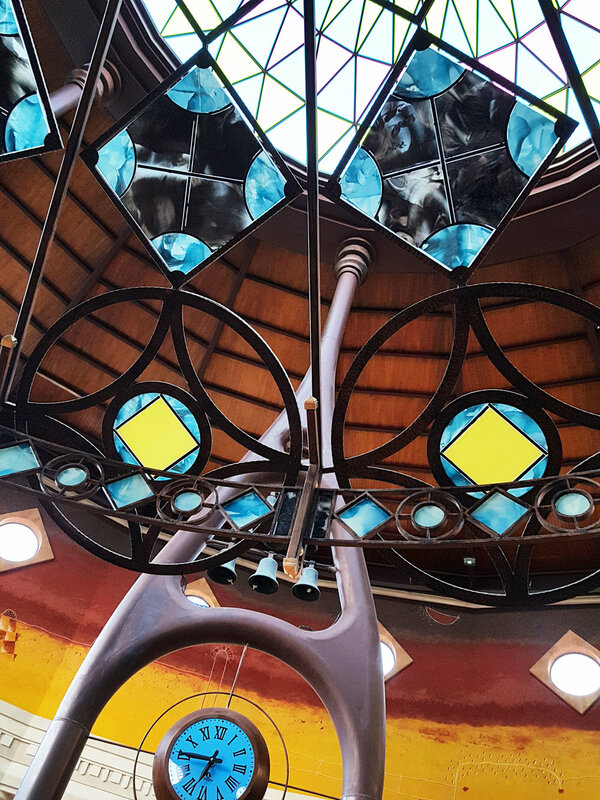 A combination of 1970s, drug-inspired architecture and a throwback hippy chic vibe. Had this structure been built or merely landed here and forgotten to take off again? The first day was a one for rest an acclimatisation; a time to meet, greet (and eat), as well as to gain orentation for the hotel and the local surroundings. For any cyclist, the search for good coffee is always on high on the agenda, and here, dear reader, we must offer a mea culpa. Manuel Buck of the esteemed Gran Fondo joined us in our quest, and a friendship was formed. A mountainous landscape far beyond the hotel boundaries waited silently beneath cloudless skies. 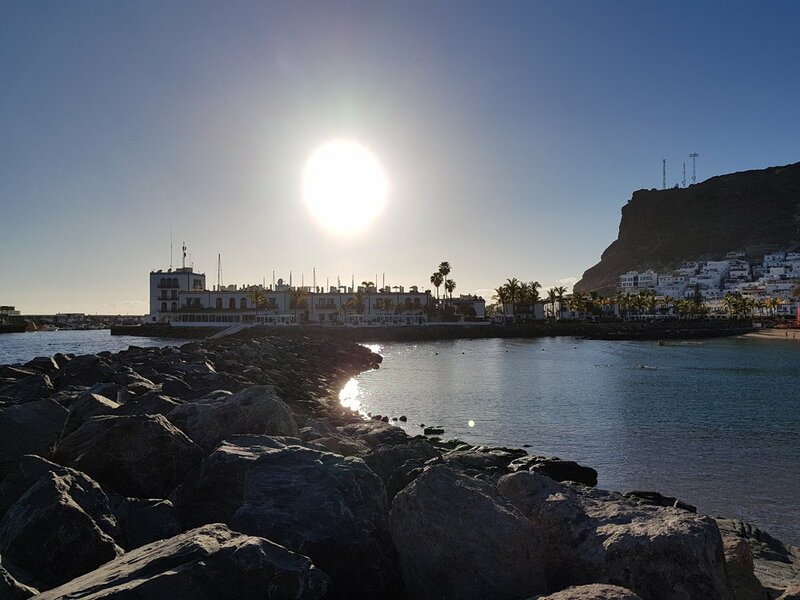 A five-minute walk found us on the beachfront at downtown Mogán. Relaxation blew in on a warm breeze - any glimpse of sunlight reflected off the sea helps ease the mind. Our thoughts turned to the following day and the joy of riding in such conditions. By the time we sat down for dinner, everyone else assigned to this first of four, four-day groups had arrived. Campagnolo had summoned a global gathering for the launch of product ‘X’ - a topic much speculated upon. Before leaving the table, we were told to bring our pedals with us to breakfast and instructed in the specific kit combination to wear the following day. A matching combo of turquoise Titanio jersey and socks with Magnesio bibs was the uniform for the first day’s riding. We, like you in all probablity, don’t like to be told what to wear at the best of times, but on this occasion could fully appreciate the neccessity, from our host’s persepective, of a united front, and the abolition of competing styles and branding that could so easily have spoiled the impact of the following day. For the next few days, we would all be part of Team Campagnolo. The hotel’s curtains may have been lined, but the sun still found an entry point. Seeping in across the tiled floor of the bedroom, long shards of light signified glorious weather for the day’s riding. The breakfast game: cyclists are creatures of habit when it comes to diet. Fuelling for a day’s riding is key to feeling good in the saddle. You build up a dietary repertoire, a knowledge of what ingredients work for you. Therefore it was the stuff of revelation what some of the world’s cycling press tucked into before riding into the mountains. Boiled eggs and fancy cakes topped the list - Simpson had already earmarked the riders to avoid out on the road. With breakfast finished, we headed to the conference area, where the guessing and speculation would finally end. For those old (and privileged) enough to remember, if you had a 10-speed racer in the 1970s, you were the envy of your peers. As a teenager, it elevated your status to someone special; you were the daddy. The gearing made your bike a serious contender and in turn you felt the same. It represented a passport to freedom and independence. The drivetrain aligned you with the club rider or racer; priveleged members of the secret, secular society that cycling clubs were often held to be back then. We find ourselves sat in a conference room listening to Campagnolo’s Press Manager Joshua Riddle eulogising the arrival of Campagnolo’s groundbreaking 12-speed Record and Super Record groupsets. The extra sprocket and attendant broadening of ratios represents the very pinnacle of engineering achievement, a marvel of modern day cycling innovation, the chance to own a slice of the future right here, right now. Hyperbole aside, the sophistication of design required in every aspect of the drivetrain to achieve this is no small feat. Make no mistake, this is (yet another) significant first for the artists of Vicenza. Campagnolo's 85th birthday falls this year, but it’s hardly mentioned - there's a more important number awaiting an announcement. The revelation of a 12-speed groupset and a complete makeover to accommodate all the complexities associated with the introduction of an additional gear came more as relief than surprise. Available for now in two groupsets, 12-speed puts this company firmly back at the forefront of cycling innovation, 85 years after Tulio Campagnolo formulated and then introduced the quick release system. Cleverly, a presentation laden with Italian flair guides us through a host of reasons why ’12’ is the magic number: the months in a year, the signs of the zodiac, the number of apostles - the list appears endless, but all associations are positive. The promo video concludes with a wry challenge: a 12-second timeframe in which to decide if the new Record and Super Record collections are the groupsets of the future. Campagnolo’s flagship groups are the first to receive the 12-speed treatment. 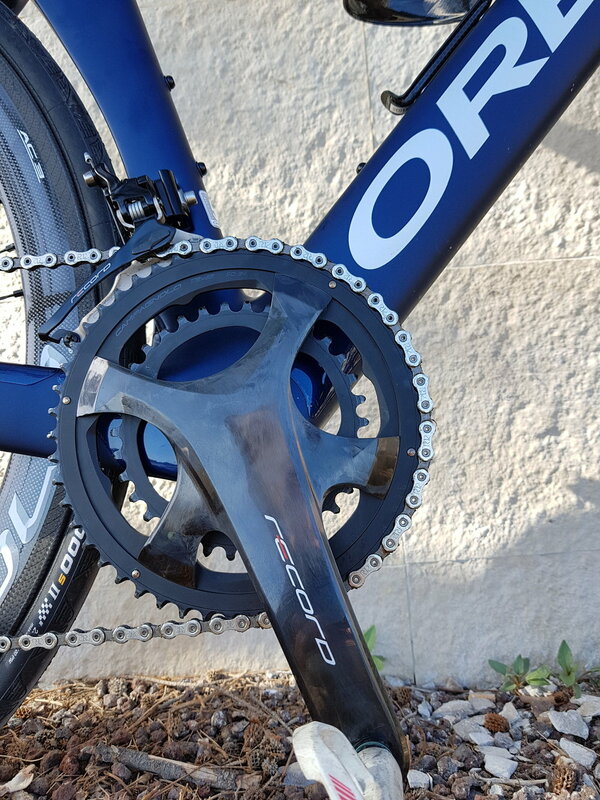 Available for now in just two ratios - 12-29 and 12-32 - it’s not only the cassette, but every part of the drivetrain and shifting system that has been refined to accommodate and maximise the potential of this new advancement in gearing evolution. A thinner chain, enhanced ergonomics at the levers and switches, finer cabling, larger jockey wheels in the rear derailleur - the list is almost endless. However interesting the background to the technical developments, there’s still no substitute for first-hand experience - actions speak louder than words, every time. There’s no better education than the opportunity to engage directly with the subject under discussion. Functionality can equate, at times, to ugliness – a product that ‘does the job’ - but Campagnolo acknowledges that a cyclist isn't a machine, but flesh and blood. Aesthetics and efficiency must work together - this is indicative/reflective of Italian culture and philosophy. The difference, in automotive terms, might be marked by attempting to compare an Alfa Romeo to, say, a Lexus. For Campagnolo, the engineer is also an artist. Would the new equipment prove their ability to grasp the truism that beauty is more than skin deep? We were there to find out. With the presentation over, we were allocated our individually prepared machines. Which bike would it be? The clue lay in the pedals. Lined up outside the conference building, Campagnolo had amassed a selection of the finest bikes on the market (and arguably in the world) and equipped each with the new Record 12-speed group set (Super Record was saved for Day Two of riding). 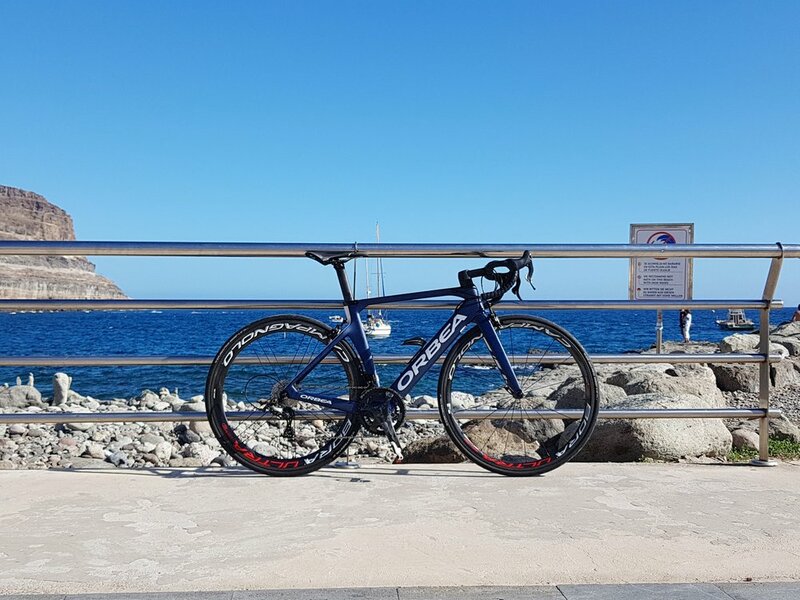 Were we to create a list of machinery with which a cyclist might distract himself, any of the bikes assembled by Campagnolo would rank highly. We’ll cut to the chase: complete and utter two-wheeled heaven. Confession time: the blood rush of euphoria, the giddiness that momentarily replaces logic and reasoning, was upon us and focus was temporarily lost. We rode an Orbea Orca Aero, built around an incredibly stiff, very lightweight frame. The bike felt and rode fast from the very first pedal stroke. The experience was further complemented by our virgin 12-speed Record groupset. Instantly, we realised the impact and importance of the advances Campagnolo had made. You could ride in the big ring for longer; the additional sprocket made changes with the rear derailleur notably more smooth and fluid. When you were forced, eventually, to use the front derailleur, the sensation was of almost EPS-like immediacy. The action was precise and almost soundless - an experience that threw into question the need for non-mechanical set-ups. From the off, Team Turquoise gunned it to the hills under the watchful eye of a couple of support vehicles headed up by Thomson Bike Tours and a Campagnolo support car. We were also joined out on the ride by the company’s latest ambassador and Italy’s last World Champion, Alessandro Ballan. So what’s it like riding with such an outrageous talent? Ballan is a quiet, unassuming guy - softly spoken even, when conversing in his native tongue - and ever smiling. Humility does not always come naturally to those who have worn the rainbow stripes (why should it? ), but Ballan is as humble as they come. We enjoyed his company on the road, unavoidably in awe of his grace and power on the bike. We couldn’t help but wonder what small percentage of his capacity he had engaged to ride with us. His speed on the climbs was a modest deception, only discovered when a group of local riders jumped on his wheel. After a brief backward glance, Alessandro simply turned up the gas, his smooth riding style and immense power underlining his pedigree and credentials. We gaped as mere mortals innocently took on a former World Champion. Which party do you watch? He ‘innocently’ shredded everyone on his wheel. It was a joy to behold - the stuff of legend and a tale to dine out on for years to come. Sharing the road with a rider of Ballan’s calibre, you realise again why smoothness is such a sought-after commodity among cyclists. It promotes efficiency, reduces energy consumption and, most importantly, prolongs the enjoyment of the ride. Campagnolo’s new 12-speed groupsets are the materialisation of this statement. 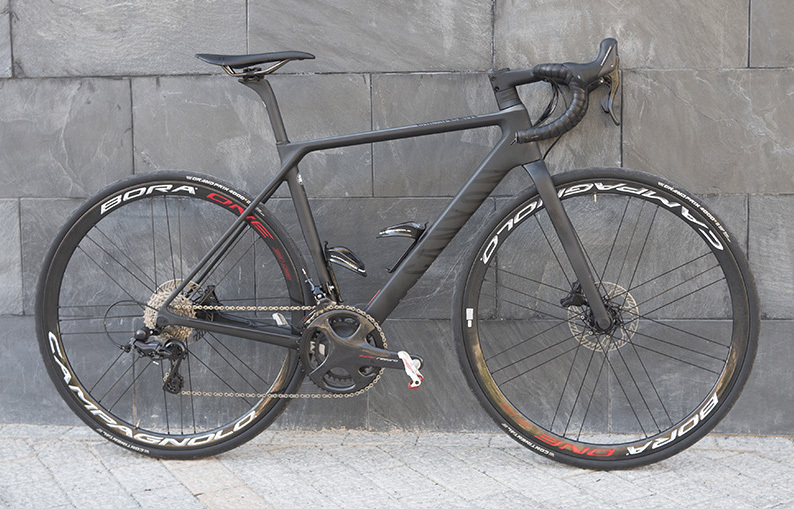 Another bike and another set of kit - enter the flagship Super Record 12-speed groupset in combination with disc brakes. Today we’re the men in black and a Canyon Ultimate CF SLX has our name (pedals) on it. For this road test, we are driven to another part of the Island. It’s another beautiful day that gives rise to further reality checks. During both days of riding, we sit in the gruppetto, a position that afforded us valuable time with Alessandro. We watched how he used and configured the new ratios. In short, we learned a lot from him. His riding style epitomised the qualities inherent in this 12-speed set up. With a wink and a backslap Press Manager Joshua Riddle tells us to ‘Keep that 32 in reserve - you're going to need it!’. It's the last 4km of climbing before the descent. Road signs at the beginning of the climb that forewarn us of its unsuitability for cycling prove accurate. 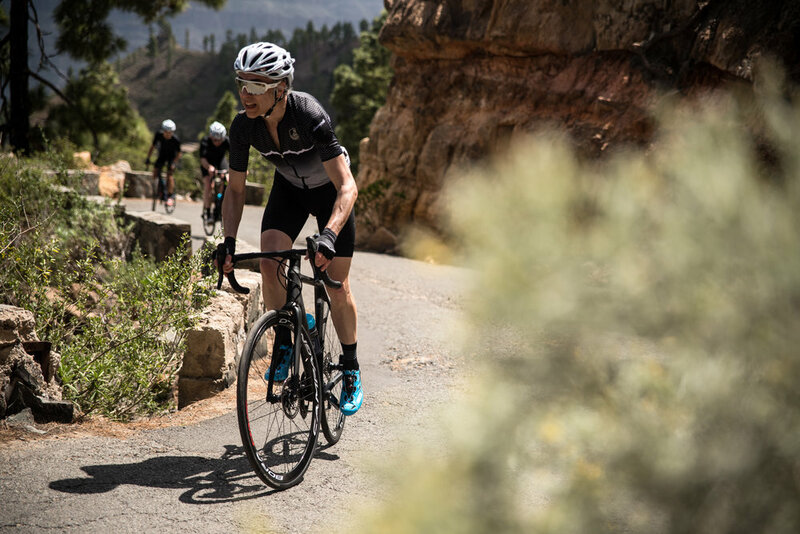 The climb savagely renders Team Campagnolo, an outfit suddenly grieving for the loss of flat roads. Regrouping at the top is a lengthy affair, but the final descent of the day is worth the effort. 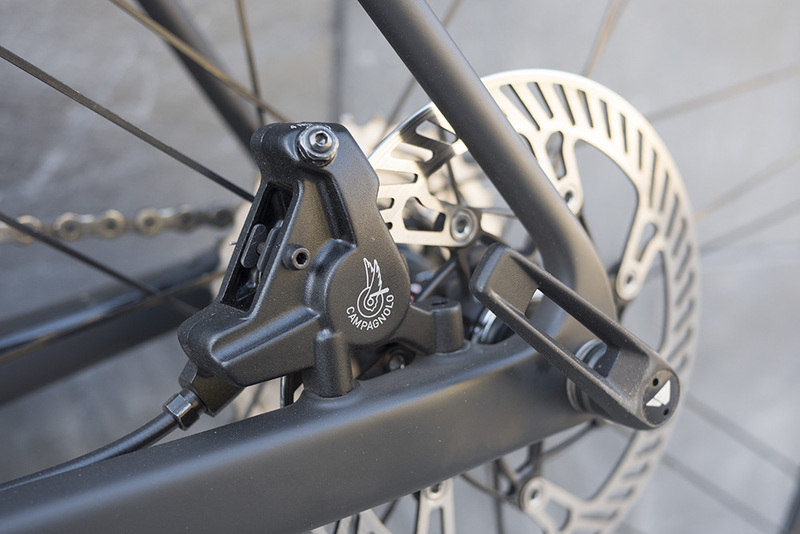 The topic of disc brakes still divides the industry and riders alike. Campagnolo's stance is clear: to produce the finest product for both preferences. Job done, we’d say. Having ridden and savoured both mechanical and non-mechanical incarnations, it feels like they have achieved their goal. For any future Continental mountain descents (think roads as incomprehensibily twisting as squeezed toothpaste), disc brakes will be my ‘go-to’ option, every time. On more level terrain, rim brakes will remain my option uno. We found ourselves asking what a 12-speed drivetrain represents to the everyday road cyclist? Is it a technology that’s evolved simply because it can be achieved, or is this advance truly beneficial for cycling? Have Campagnolo created 12-speed groupsets for the right reasons? Having ridden the new Record and Super Record groups, and been able to appreciate these advances for ourselves, we truly believe this is the future for cycling. And, yes, we definitely want to be a 12-speed hero.